The seventeenth housemate who entered the Pinoy Big Brother House was Vickie Rushton. 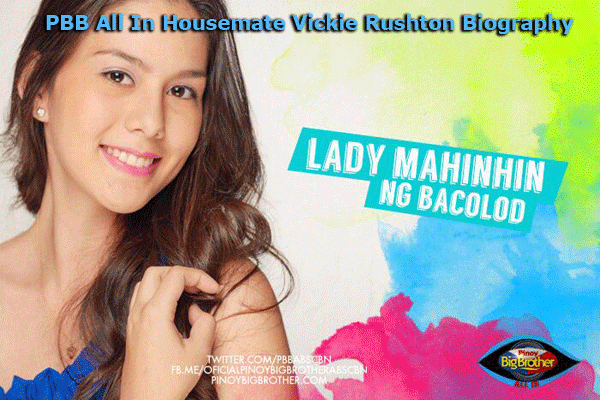 Dubbed as “Lady Mahinhin ng Bacolod,” Vickie is 21 years old. Her mother is a Filipina and her father is a British but they separated when she was just 8 years old. One of the biggest challenges that her family is facing right now is her mother being blind because of glaucoma and she also has a brother who is a special child. In terms of beauty, Vickie has something to say. In fact, she is an undefeated beauty queen of Western Visayas holding the crown for Mutya ng Pilipinas 2011. Currently, she is in a relationship with Jason Abalos, a Kapamilya actor and going steady in their relationship for almost a year. She studied in University of Saint La Salle – Bacolod. Her motivation of joining Pinoy Big Brother is proving that she is more than just pretty face and there are things about her yet to unfold. She would like to prove something about her personality. Vickie is a model and is into modeling nowadays. She is truly someone to look forward to inside the Big Brother House knowing that most of the housemates are good looking and one of them is Vickie. Support Vickie by watching Pinoy Big Brother All In every Monday – Friday at ABS-CBN Primetime Bida. The Bacolodnons are looking forward for Vickie’s good performance inside the Big Brother House. It is truly exciting to watch Pinoy Big Brother All In that showcases each housemate’s capability of coping with different situations inside the house. Be updated with Vickie Ruston who is truly Negros Occidental’s pride. She will be inside the house for 100 days. Will her beauty be able to bring her to the top? Well, let us see what will happen next.